As the revolution's second anniversary approaches, Egyptians' core economic and social demands remain unfulfilled. On 25 and 28 January 2011, thousands chanted "Bread" on streets across Egypt, highlighting the economic nature of the uprising. The chant represented the people's aspirations for a fairer economic system, protesting high inflation rates, low wages and the unavailability of daily rations. It is no coincidence that bread was the first word of the revolution's main slogan ("Bread, freedom, dignity"), as it is a daily staple for millions of people, making Egypt the largest per capita wheat consumer and importer. "The demand for bread or daily rationing has been central to the Egyptian people's economic and social demands since the 1977 bread uprising," Khaled Ali, labour lawyer and ex-presidential candidate, told Ahram Online. "Food security is the Egyptians' most basic right and the people's struggle for enough to eat will continue," explained Ali. It has been two years now, and matters seem to be deteriorating rather than stabilising. Food protests have continued after the revolution with inflation reaching new peaks and basic necessities moving further out of reach for whole communities. Egypt's poverty rate increased to 25.2 per cent of the population in 2010-2011 compared to 21.6 per cent in 2008-2009, with this year's statistics expected to reach higher rates. The national unemployment rate rose to 12.6 per cent in the second quarter of 2012, according to Egypt's official statistical agency CAPMAS, compared to a rate of 11.8 per cent during the same period a year earlier. On the overall social and economic level, little has been achieved to fulfill the aspirations of the revolutionary masses. One of the most common grievances before the revolution was increasing food prices, a grievance that had caused social upheaval since 2008. Food price inflation was a main instigator of social protest throughout Egypt's modern history, according to a study published by the International Food Policy Research Institute in July 2012, entitled "Does Food Security Matter for Transition in Arab Countries?" The report indicates that the 2011 popular uprising was sparked, in part, by resurgent food price inflation. Inflation rose to levels above 12 per cent in the year 2011 due to the surge of general food prices, levels not far from Mubarak-era rates with the exception of the alarming 16.4 per cent price inflation in 2008. The inflation rate is forecasted by the International Monetary Fund to reach 10 per cent for the year 2012. Overall, food and beverages prices increased by 7.8 per cent at the end of 2011 compared to the same period in 2010. Food price inflation remains burdensome on the society's lower strata, fueled by a surge in international food prices that the Food and Agriculture Organisation (FAO) of the United Nations says is likely to occur. "The economic crisis is not only affecting the poor; price hikes are affecting us and we are unable to live. It is becoming unbearable," Om Ahmed, a vegetable seller in Sudan Street in the middle-class district of Mohandessin, told Ahram Online. Inflation is expected to increase in 2013 and a proposed government plan for tax increases and subsidy cuts is expected to lead to skyrocketing prices. "A new wave of high inflation, which is likely, will definitely affect living standards and food security among Egyptian households," Omneya Helmy, deputy director of research and lead economist at the Egyptian Centre for Economic Studies, told Ahram Online. "As long as Egypt remains a net importer, the food-price inflation crisis will be relevant." Two years on, the highly demanded "minimum-wage" law is still unimplemented and seems to be ignored by the government. Moreover, the newly enacted constitution, drafted by an Islamist majority, clearly states in Article 14 that wages are to be tied to production instead of prices. Improving the quality and availability of state subsidised bread was one of the key, populist pledges in President Morsi's 100-day programme. The price of bread has remained unchanged since the 1980s thanks to a policy of regular government intervention to stabilise the price of subsidised bread. Until this day, the price of a loaf of bread is about five piastres. During the last decade, Egyptians have suffered from the frequent unavailability of bread due to wheat shortages and the poor quality of bread, leaving families at times without food rations. "It is still a very tiresome process to purchase subsidised bread, as it was before the revolution: long queues, and sometimes bread isn't available. It's a daily struggle," Samya Ahmed, a housewife and regular subsidised bread customer at the Sudan Street state-run bakery, told Ahram Online. The Hisham Qandil government, like its predecessors, has endlessly repeated that the shortage problem is mainly related to corruption and bribery on the part of bakeries producing subsidised bread. Nonetheless, the Qandil government was able to achieve some improvements regarding the quality and availability of subsidised bread. During August and September 2012, the Qandil government successfully implemented a programme aimed at improving the production and nutritional value of bread flour. The move was positive, and was able to reduce bread shortages to a certain extent, but not to end the crisis. The recently implemented reforms mean that state-run bakeries are able to produce better subsidised bread and make it more accessible, as well as to ensure equal distribution in all governorates, President Morsi announced during a speech at Cairo Stadium earlier in October 2012. Altering the bread subsidies regime is highly unlikely as it could lead to social unrest, according to analysts, though it poses a huge burden on the state budget, expected to reach LE16.2 billion in 2012-2013. Bread shortages hit several governorates in 2012, from the Nile Delta governorate of Kafr-El-Sheikh to the governorate of Assiut in Upper Egypt. 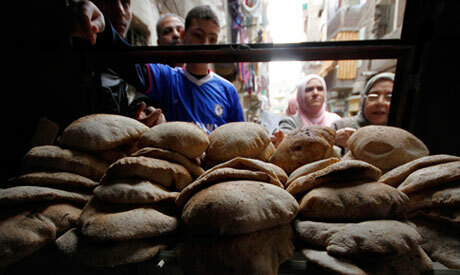 The majority of Egyptians remain unable to buy subsidised bread on a regular basis. Brawls at bakeries, as a result of shortages, are still common.